In October 1892 A.D. Sacred Heart Church and School were founded by Bishop Winard Wigger on the corner of Sandford Avenue and South Orange Avenue. This building we all knew as the "old" Sacred Heart School. The downstairs was the Church where Mass was celebrated and the upper floors made up the school. Remember the front of the old school? The South Orange Avenue stair cases were " A" shaped. You could ascend them from either the right or left side to get into the school. The steps underneath them led to the old Church. The old school was moved from the corner of Sandford and South Orange to the corner of Hazelwood and South Orange in 1926 A.D. This provided the area needed to lay the cornerstone in 1927 A.D. for the new Sacred Heart Church. This church was finished in 1928 A.D. I'm proud to say my father worked on it in as a pipe fitter, prior to going on the Newark Police Department in 1928 A.D. This Italian Renaissance church structure was one of the largest parish churches in the country when it was built. It has a seating capacity of 2,480. It is well known for its marble alters and fine mosaics. When I was a young boy in the 1940's and 1950's this was the richest and largest parish in New Jersey. The pastor was Monsignor Murphy. He was a tough short old Irish priest with a temper and red hair to beat. He ruled with an iron hand. I remember hearing once that a tavern Gelsilier's (sp?) Circus Lounge on the corner of South Orange Avenue and Brookdale Avenue had a problem. They had a objectionable vending machine in the men's bathroom. When Monsignor Murphy found out about it he called Gelsilier's on the phone. He told him to take it down or he would march down with a crowbar and remove it himself. The special Sunday collections on Easter and Christmas were done by the priests as the Monsignor walked the aisles. Most masses were standing room only and the Monsignor made a point of walking up and down the aisles looking at everyone. The 900 A.M. Mass was for the children. You sat with the Sister of your class. I went to Lincoln School so I sat in a generic section. One sister had a cricket for cadence. A click would indicate stand, sit and kneel. It was a site to see ( ultimatum precision ). Discipline! Discipline! Discipline! There is a flip to discipline and that is security. That is you were always taken care. You were never left out. Sometimes it may have seemed like you were knocked out but never left out. You new the rules and all you had to do was follow them. Being a wealthy parish they did not keep it to themselves. In that time frame (1940'-50's ) Grammar school was free. Upon graduation they paid " total tuition" for your education to either Seton Hall Prep. (for the boys ) or Saint Vincent's Academy (for the girls ). 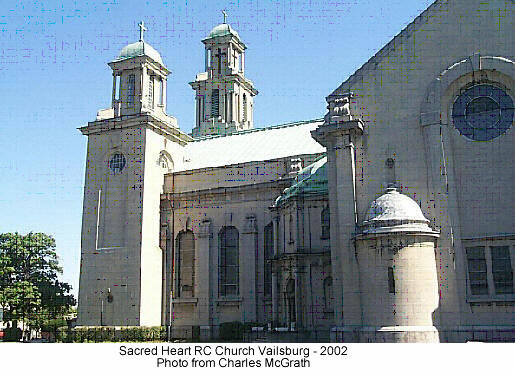 They were the Golden Years for Sacred Heart Church and the Rock of Vailsburg.